The fourth installment in Quadro RTX series features a full Turing TU106 graphics processor. 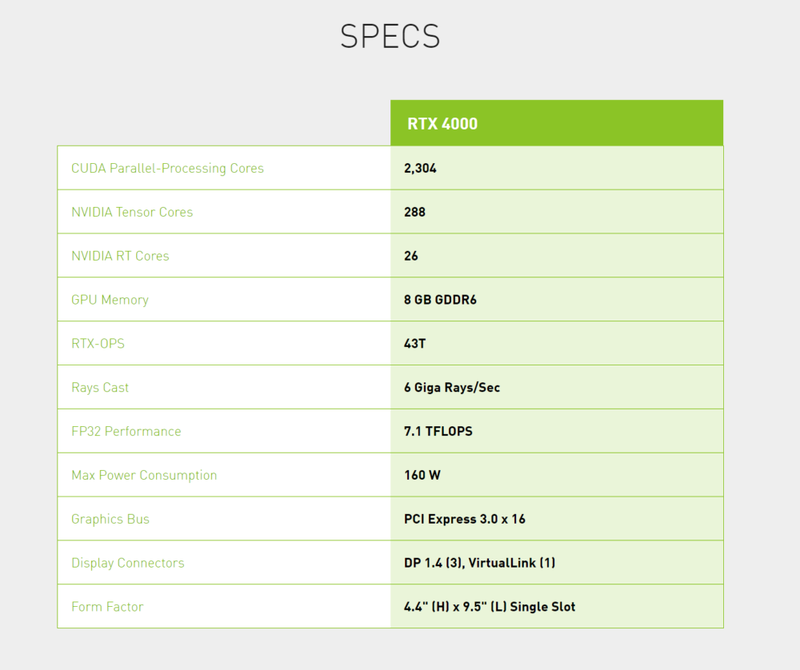 The RTX 4000 features 2304 CUDA cores, 288 Tensors, and 26 RT cores. The card offers up to 43T RTX-OPS and 6 Giga Rays/s. The FP32 performance is estimated at 7.1 TFLOPS, which translates into a boost clock of around 1540 MHz. The TU106-based Quadro has a TDP of 160W and has been enclosed into a single-slot solution. Unlike GeForce RTX 2070, which is using the same chip and memory configuration (8GB GDDR6 256b), Quadro RTX 4000’s memory is clocked at 6500 MHz, which means 500 MHz slower than GeForce. NVIDIA is planning to sell Quadro RTX 4000 for 900 USD starting from December.